This is for a series of posts for a 2014 Chicago trip including Alinea, Giordano's, Bottlefork, Bub City, Portillo's Hot Dogs, Doubletree Hilton: Magnificent Mile, and Garrett Popcorn Shops. During a recent trip to Chicago, I booked some rooms at the Doubletree Hilton a block away from the Magnificent Mile. In addition to offering Northwestern alum discounts, they were at the center of all the tourist attractions the GF's family was looking to explore. At first glance, we were a bit unnerved by the fact that there were buckets in the middle of the lobby, catching water dripping from the ceiling above. But luckily, everything was fine by the next day. As with all Doubletree Hilton locations, we were welcomed with a warm cookie and some bottled water. Who can complain about that? There's also a bar at this location, which seemed to be a prime spot for people to get drinks before going out. And because the World Cup was on during this time, there was definitely a crowd here during the game. In addition to the location, one of the main reasons we decided to stay at the Doubletree Hilton was the supposed view of the lake and the rooftop pool. Alas, despite being on the upper floor, there were quite a few buildings that restricted a true view of the lake. And the rooftop pool? It's on the roof of the lower tower - not an exactly an escape. The bathroom was the biggest disappointment - definitely hasn't been renovated since the 90's and the water pressure was lacking. On the other hand, the 24 hour gym was just fine. 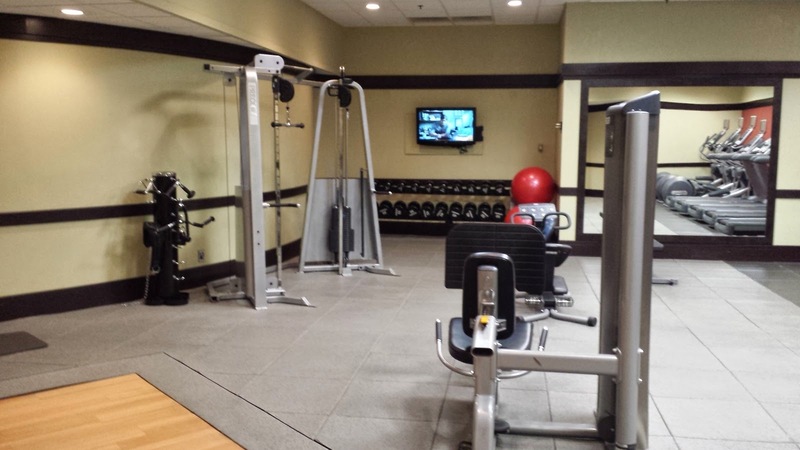 They had free weights and several machines. 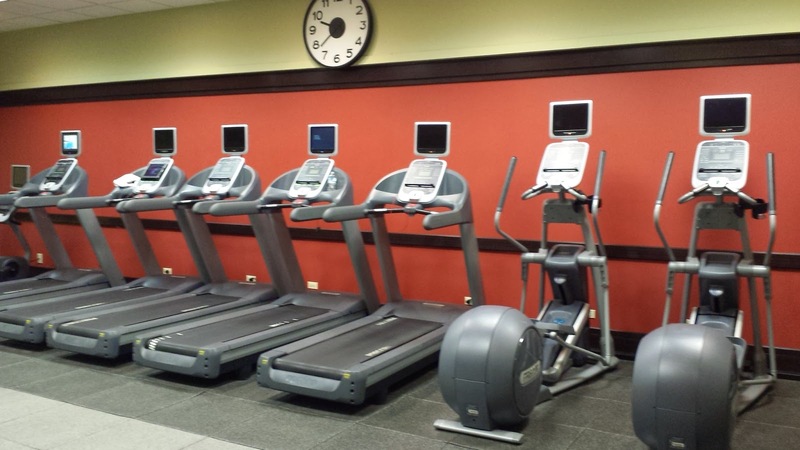 And for your daily cardio, there were plenty of treadmills and ellipticals. Overall, if location is key, the Doubletree Hilton will suffice. It's a bit dated if you're looking for a luxury experience, but when it's only $175 per night, it's got pretty much everything you need.